This basketball rebounding drill will focus on close-outs, boxing out, and winning the rebound after a shot. You will need at least 7 players and 1 basketball for this basketball rebounding drill. Set up 6 shooters positioned around the 3-point arc. One player will start in the middle of the lane as the rebounder. The rebounder will start the drill by passing the ball to the first shooter. The rebounder than sprints to close-out the shooter. Once the shooter shoots, the rebounder boxes out the shooter and rebounds the ball. Once the shooter rebounds the ball he then passes to the next shooter and sprints to close-out the new shooter. The drill continues until the rebounder has rebounded all 6 shooters. Once the rebounder has successfully rebounded his 6 shots the players rotate. 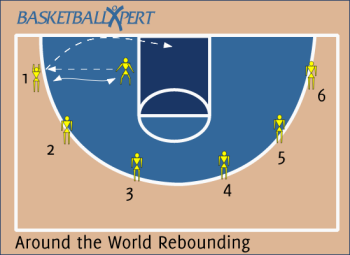 The rebounder moves to the first shooter's position and the 6th shooter becomes the rebounder. Allow the shooters to either shoot or take it to the basket. This will keep the defensive player honest when shutting the shooter down. Rotate after 6 rebounds in a row instead of just all 6 shooters. This will make the defensive player have to work harder for the rebounds. Make sure the defensive player is closing out the shooter properly. Go up for the rebound when necessary.